The No. 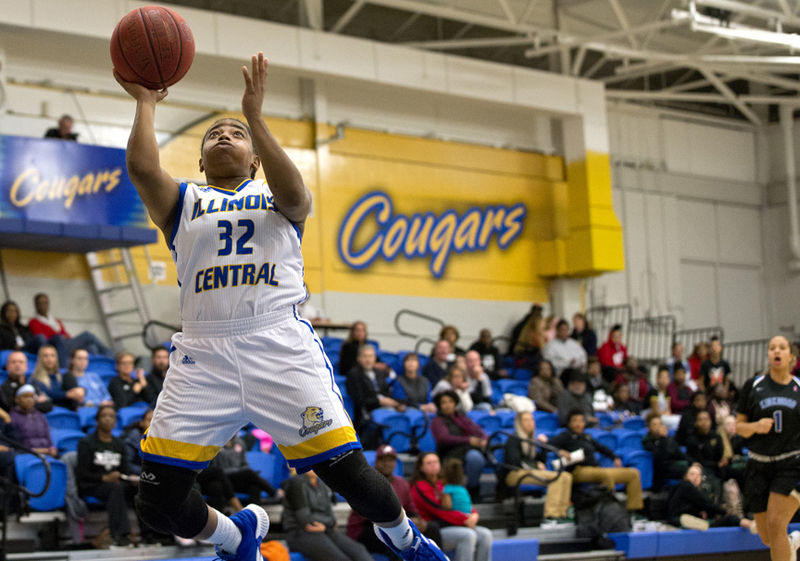 4 Illinois Central College women’s basketball team controlled the boards and used balanced scoring to get an 80-61 win over Jefferson College on Saturday afternoon at Ramsey Gym. The Lady Cougars out-rebounded the Vikings 52-31 and held them to 32 percent field goal shooting, 22 percent in the first half, to get the win and move their record to 10-1 on the season. The Lady Cougars’ game plan was to get the ball in the paint and they had the right idea as Rocky Stanley, Abby Coates and Madison Faulkner scored early to give ICC an 8-7 advantage. Josi Becker and Emma Henderson scored on offensive put-backs followed by a Stanley score to put ICC up 14-9 after one quarter of play. ICC cranked up the defense in the second quarter as steals by Stanley and Summer Stoewer led to Marquitta Easley and Kathy Pinnock-Branford layups. The Lady Cougars continued their scoring spree as Faulkner, Stoewer and Pinnock-Branford scored inside, followed by a Stoewer 3-pointer and layup 29-13 with 4:09 to play. One of the trademarks of the Lady Cougars is to share the ball, and amazingly, all of the baskets during the run were scored off of passes — assists Stoewer, Pinnock-Branford and Easley. Moriah Ward joined the party with a score, assisted by Faulkner, and Easley nailed a 3-pointer, assisted by Becker, to give ICC a 34-15 lead at the half. Stanley, Coates and Faulkner established the inside game in the second half as they combined for the first 12 points to push the lead to 45-19 at the 5:33 mark. A Faulkner basket gave the Lady Cougars a 49-19 at the 4:06 mark, but the Vikings closed the quarter on a 16-3 run to make the score 52-35 heading into the fourth period. A Stanley layup, assisted by Pinnock-Branford, and put-back got ICC back on track, which catapulted them to go on a 13-0 run as Easley added six points on steals by Stanley and Ward. Stoewer splashed in a 3-pointer from the top of the key, assisted by Easley, Coates had a put-back, Easley a layup, assisted by Coates, and ICC grabbed their largest lead at 69-37 with 5:53 to play. Catora Brown and Jordyn Hare added baskets, but then the Lady Cougars went cold as the Vikings heated up to lead to the final margin. The Cougars are back at Ramsey Gym on Monday, Dec. 17 as they host Carl Sandburg in a 6:00 pm start. The game will be live-streamed at www.icc.edu/athletics.